Estrella Del Norte Vineyard is just down the road from us here on our sit in Nambé, New Mexico. 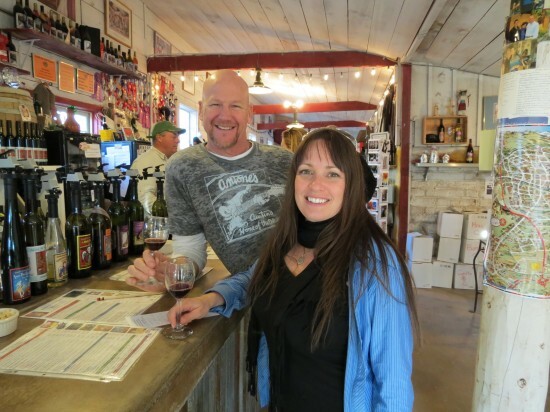 Owners Richard and Eileen Reinders are friends with one of our favorite Colorado people, Jen. Jen came for a quick visit just before Christmas. Our dear friend Sadie was here at the same time, and the four of us went to visit Estrella Del Norte Vineyard, fell in love with the wines, and next thing you know, I have a job. Synchronicity! 1) So many people I know are fascinated by all things wine. I would say it is up there in the top ten dream ways to make a living. Who or what gave you the inspiration to create Estrella Del Norte Vineyard? How long did it take you to go from vision to conception? Our inspiration to develop a winery came to us when the house we bought in Nambe’ had an old run-down vineyard of pinot noir and cabernet sauvignon grapes on the property. My husband, Richard, immediately saw the potential that reclaiming the vineyards and developing the property could bring as a winery in our beautiful valley. I was born and raised in Santa Fe and our return here was “coming home” for me. When Richard talked about the vineyard possibilities, I immediately felt that, indeed, the soulful thread of my history, culture, tradition and upbringing could be braided with our vision and our vineyard could become something truly special that could be shared with others. Now that we were like the “dog that chased the car and caught it” our next step was figuring out how we were going to make the wine side of the business happen. Richard sought out the other wineries in our area and got working with them, voluntarily, to understand the practical end of the business. He also became a student of “Google University” and learned as much of the theoretical as he could. Using his successful history of business development, very hard work, and discipline we soon got our license and opened our doors as Estrella Del Norte Vineyard. 2) Tell us about the name of your vineyard. My maternal great great grandmother’s name was the inspiration for naming our estate Estrella Del Norte Vineyard. The Ute called her Nah-oh-kohs, the White called her North Star and the Spanish version we selected was Estrella Del Norte. The property is very deserving of its namesake because it truly is very special — mostly because it’s unexpected in our mostly dry area. With the beautiful 200-year-old cottonwood trees and lush vineyards and gardens when everything is in bloom, it is an oasis in the north. 3) Everyone I know romanticizes this lifestyle. Is it as romantic as it seems? What do you find most fulfilling about it? Most challenging? There’s a tremendous amount of work involved with the winery – from growing the grapes to retailing the wine in the tasting room and working all functions of the business to make it effective and prosperous. We are a true “poster child” for agritourism. There are challenges to all part of our work that come with owning and managing a business — regulation, signage, human resources, marketing, IT, etc., — and realizing that you are all of these departments and solely need to get it all done — especially for myself coming from a corporate background where these things were handled by others! From the agricultural side, making sure we have water in the drier seasons, managing our three vineyards, orchard, and gardens with mother nature’s unexpected events, and making sure we stay ahead of the curve. The rewards are tremendous. Our estate Pinot Noir took a gold medal at an international wine competition where wines from all 50 wine-producing states, 19 countries and six Canadian provinces competed. 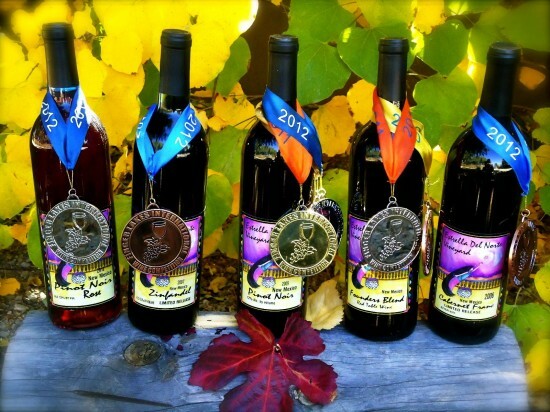 We entered our Pinot Noir 3 times and we medaled 3 times! In fact, all of the wines that we’ve submitted for this competition have medaled. That is such an honor and a badge of excellence for us. Importantly, we’ve met so many wonderful people and it’s gratifying to be able to share the results of what we are working on with them in the form of the vineyard experience i.e., the wine, a vineyard dinner, a volunteer harvest, or a stroll through the property. The other part of our rewards is the “winery family” that we have with our tasting room and vineyard employees and our pets. We have been blessed in so many ways and for all things we are so very thankful. 4) Paul can’t get enough of your Zinfandel. I am crushing big-time on your Barbera and Mourvèdre, and everyone loves Holy Mole! What are your current favorites? I stand by the cliché “our wines are like children – I love them all differently”! Right now, for red wines I am enjoying our estate 2010 Pinot Noir and our 2010 Cabernet Franc! For white wines our 2011 Riesling (Alsace-style off dry) and our 2011 Symphony! We have over 26 Estrella Del Norte Vineyard wines, plus our Santa Fe Vineyards and Black Mesa wines which gives us over 65 wines to pick from – hey, it’s tough living in the “candy store” and having any one favorite! 5) I am so excited to learn everything I can about wine and to meet new people. I know people come from all around to visit your vineyard. Where is the furthest someone has visited from, that you know of? Antarctica! A lovely lady who had been working at a bio lab as a researcher visited Estrella Del Norte Vineyard during her visit to Santa Fe. We’ve also had visitors from Croatia, Africa, Europe… I’d say almost every continent! And, Valynne, we are also excited to have you coming on board to work with us! You’ll learn so much about wine and other wine business things, and I know we’ll benefit from your great personality and talents. 6) Ever since owning my own small bath and body products business, I am a bit of a label fiend. Tell us about your gorgeous labels. Our Estrella Del Norte Vineyard label represents my great-great-grandmother reaching for the North Star with the vines behind her! Our Holy Mole’, Luna Pera Especial and Geronimo’s Gold wine labels are done in a Dia De Los Muertos art style. 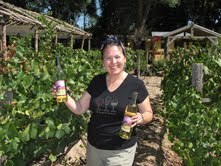 Our labels are designed to reflect both our personal and winery culture with some fun creativity. When someone purchases a bottle of our wine we want them to get a sense of the terroir, the care and craftsmanship that went into the making of our wine and the influence of our Santa Fe culture in its presentation. 7) There is more to your vineyard than wines. You have a sculpture garden, wall murals, a gift shop, and a new community garden coming this spring. Did you know you wanted to bring all of these facets together from day one, or have they evolved over time? These items evolved over time. Richard, has the gift of seeing the full potential of an opportunity, the talent, discipline and back-bone (hard work) to bring it to fruition. With the balance of the things that I do well, our strict focus is on bringing fun new things to our vineyard for our customers to enjoy. There is nothing more important to us than delivering excellent customer service in our business. 8) Tell us about some of the events you are excited about this coming season. We have four vineyard dinners scheduled for this summer season, each featuring a top chef from Santa Fe’s finest restaurants. The chefs use our wood-fired ovens and wood-fired grills for the meal preparation, they talk with the guests about the foods they are preparing and a host of other culinary information. They are really special and so much fun and they always sell out early. More information about these events is available on our website www.estrelladelnortevineyard.com. Also, through our partnership with Santa Fe School of Cooking we are scheduled for 7 cooking classes at our vineyard. The chefs use our wood-fired ovens and wood-fired grills and we serve our wine with the meal. We will also host some private events. 9) What is the easiest way for our out of town friends to get their hands on your wine?! We have an awesome online store that lists all of our Estrella Del Norte Vineyard wines, Santa Fe Vineyard wines and wines from Black Mesa Winery. Customers can mix their orders from the different wineries and create an excellent selection of different New Mexico wines. 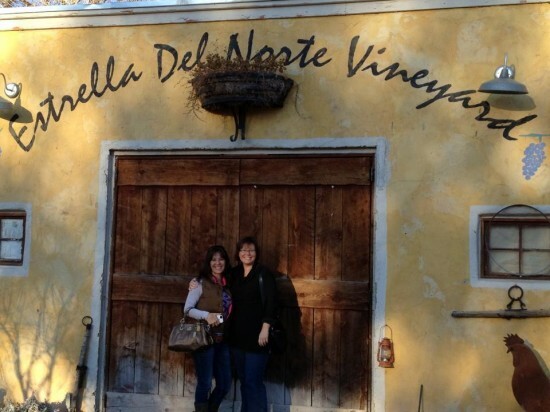 We love when guests are able to visit our tasting room so we can meet them and provide the full Estrella Del Norte Vineyard wine experience. We also have a fabulous Wine Club which gives them an opportunity to try our wines based on their preferred wine types (red, white, both or sweet) and we select wines for them monthly, quarterly, or semi-annually — and it doesn’t cost anything to join our wine club! Thank you again, Eileen. I can’t wait to get started at my new job! And thank you all for reading along. I am looking forward to sharing many more stories and pictures with you in the coming months.